What an interesting insight into this great leader in history! Also revealed is an understanding that there are distinct seasons in the book of life and it is healthy, at pivotal points, to turn a page and focus on another avenue. I also like that Churchill saw that writing and painting were worthy pursuits. A painting might seem as an picture of mere objects, a scene, or a likeness of a human being. But an artist recognizes there is much beneath the surface and our view of life is somehow reflected in the images we choose to interpret and display in our corner of the world. A body of work taken together reveals attitudes and beliefs in the artist that eventually come to light. In this season of life I have been working on some small simple canvases of mainly fruit and flowers. What could be more generic? In one sense these objects are some of the most common ever painted and will never distinguish themselves in any particular way. But in their commonality they are also universal objects that tend to resonate with a wide variety of people. Resonating is the word I am looking for right now. 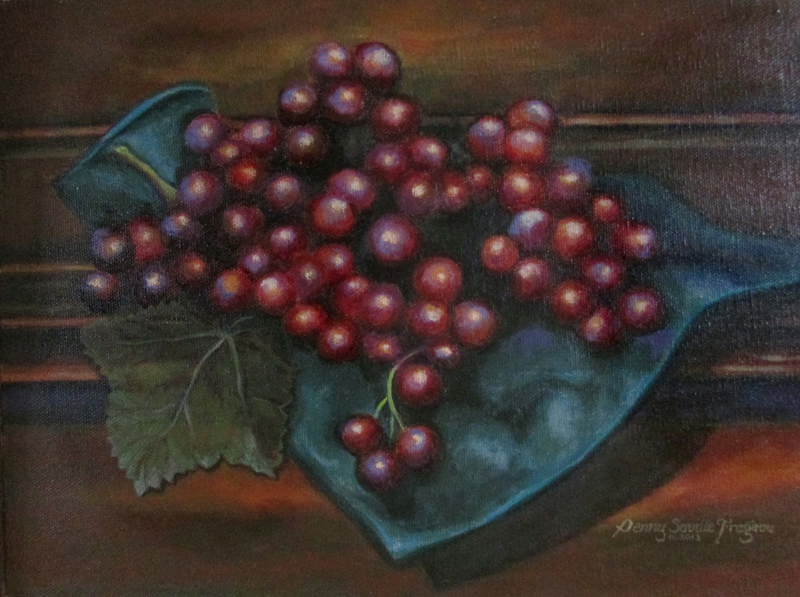 The pieces show a high contrast, typical of my work, and an attempt for vibrancy of color – developed over years working under the tutelage of a master colorist painter. I am still trying to call the mind the great lessons he taught. The contrast in my work indicates that life has a full range of experience – dark foreboding times juxtaposed against accents of brilliant joy – all on the same canvas. The selection of color notes accentuates the fact that what makes one color gloriously vibrant is the drab messy colors right next to it. All bright colors would read, as my teacher used to say, “too much sugar.” A dessert with a blended mix of delectable flavors triumphs over cotton candy any time. The compositions, while definitely needing more work, are thoughtfully constructed for balance, harmony, visual interest and hopefully, beauty. I live in a small rural community that has been economically depressed for years. A former flourishing lumber mill and fishing economy region succumbed to the changes in the environmental and political landscape. And so I attempt to create things that are affordable and that would easily grace a variety of homes or small restaurants. In some small way I hope these canvases create a spot of visual beauty that say things like “real,” “optimism,” “faith,” and “hope.” For even the darkest chapters in life cannot sustain themselves without these ingredients. The name of your new blog fits you, because you have all three.